The ideal of learning being so characteristically Jewish, it is natural that many Jews should have collected materials of learning for their own and others' use. The Talmud interprets Ps. cxii. 3 as applying to those who buy books and lend them out, since by this means "their righteousness [charity] endureth always" (Ket. 50a). Judaism is probably the only religion in which it becomes a duty to collect books. Each Jew ought either to write a scroll of the Law himself, or if he does not do so, must have it written for him. This he must not sell except in order to marry, to study the Torah, or to redeem captives (Shulḥan 'Aruk, Yoreh De'ah, 270). References are met with in early ethical wills like that of Judah ibn Tibbon, showing that a great deal of care was taken both to collect and to preserve books. 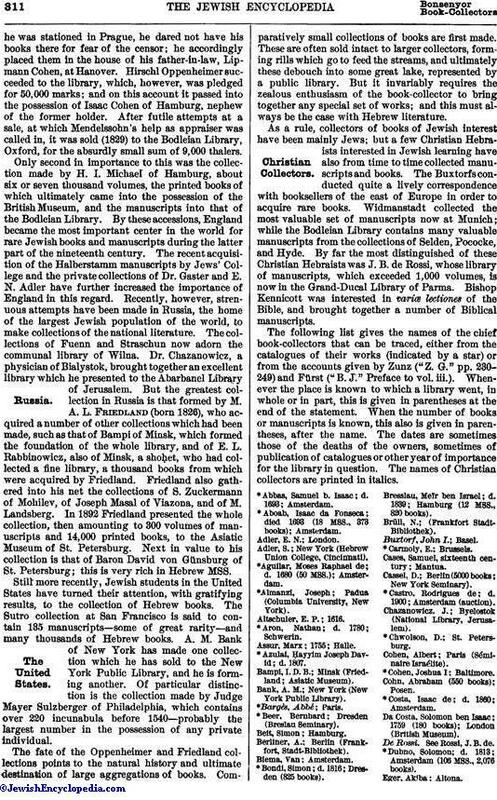 At the same time the continual expulsions of the Jews rendered it difficult to keep libraries together, as they could rarely be transported; accordingly, it is not until the sixteenth century that traces are found of any very considerable collections, the earliest of these occurring, as might have been expected, mainly in Italy, at Mantua and Ferrara. From Italy, after a time, the fashion spread to the Turkish empire, where Jacob ben Isaac Roman and Joseph del Medigo collected valuable manuscripts, many of which can still be traced. But it was with the growth of the community of Amsterdam that the taste for book-collecting among the Jews rose to dimensions worth mentioning. Here only in all Europe had they sufficient wealth and liberty to collect private libraries; those of Manasseh ben Israel, Moses Raphael de Aguilar, Isaac Aboab, and Samuel b. Isaac Abbas being all of the seventeenth century. The Amsterdam Jews have continued their interest in Jewish books up to the present day, the libraries of Isaac da Costa and Salomon de Mesa in the eighteenth and those of Rodrigues de Castro and David Montezinos in the nineteenth century keeping up the tradition; while the great Rosenthal collection, originally founded at Hanover, has reached a final home in the Dutch capital. 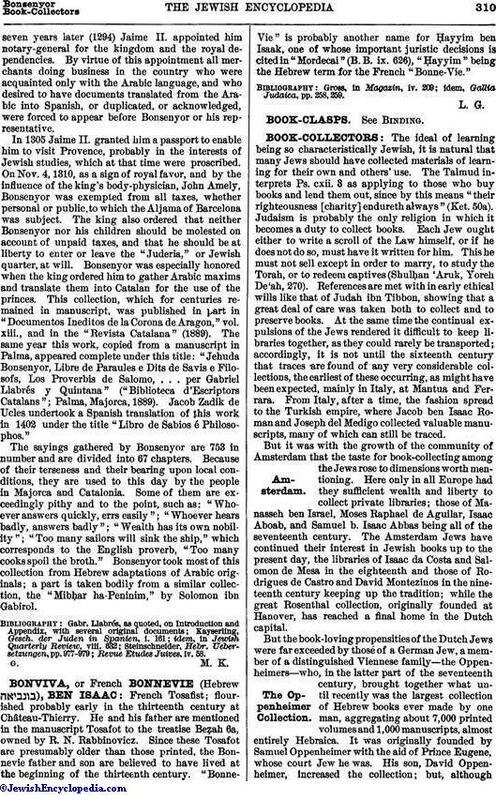 But the book-loving propensities of the Dutch Jews were far exceeded by those of a German Jew, a member of a distinguished Viennese family—the Oppenheimers—who, in the latter part of the seventeenth century, brought together what until recently was the largest collection of Hebrew books ever made by one man, aggregating about 7,000 printed volumes and 1,000 manuscripts, almost entirely Hebraica. It was originally founded by Samuel Oppenheimer with the aid of Prince Eugene, whose court Jew he was. His son, David Oppenheimer, increased the collection; but, althoughhe was stationed in Prague, he dared not have his books there for fear of the censor; he accordingly placed them in the house of his father-in-law, Lipmann Cohen, at Hanover. Hirschl Oppenheimer succeeded to the library, which, however, was pledged for 50,000 marks; and on this account it passed into the possession of Isaac Cohen of Hamburg, nephew of the former holder. After futile attempts at a sale, at which Mendelssohn's help as appraiser was called in, it was sold (1829) to the Bodleian Library, Oxford, for the absurdly small sum of 9,000 thalers. Only second in importance to this was the collection made by H. I. Michael of Hamburg, about six or seven thousand volumes, the printed books of which ultimately came into the possession of the British Museum, and the manuscripts into that of the Bodleian Library. By these accessions, England became the most important center in the world for rare Jewish books and manuscripts during the latter part of the nineteenth century. The recent acquisition of the Halberstamm manuscripts by Jews' College and the private collections of Dr. Gaster and E. N. Adler have further increased the importance of England in this regard. Recently, however, strenuous attempts have been made in Russia, the home of the largest Jewish population of the world, to make collections of the national literature. The collections of Fuenn and Straschun now adorn the communal library of Wilna. Dr. Chazanowicz, a physician of Bialystok, brought together an excellent library which he presented to the Abarbanel Library of Jerusalem. But the greatest collection in Russia is that formed by M. A. L. Friedland (born 1826), who acquired a number of other collections which had been made, such as that of Bampi of Minsk, which formed the foundation of the whole library, and of E. L. Rabbinowicz, also of Minsk, a shoḥet, who had collected a fine library, a thousand books from which were acquired by Friedland. Friedland also gathered into his net the collections of S. Zuckermann of Mohilev, of Joseph Masal of Viazona, and of M. Landsberg. In 1892 Friedland presented the whole collection, then amounting to 300 volumes of manuscripts and 14,000 printed books, to the Asiatic Museum of St. Petersburg. Next in value to his collection is that of Baron David von Günsburg of St. Petersburg; this is very rich in Hebrew MSS. Still more recently, Jewish students in the United States have turned their attention, with gratifying results, to the collection of Hebrew books. The Sutro collection at San Francisco is said to contain 135 manuscripts—some of great rarity—and many thousands of Hebrew books. A. M. Bank of New York has made one collection which he has sold to the New York Public Library, and he is forming another. Of particular distinction is the collection made by Judge Mayer Sulzberger of Philadelphia, which contains over 220 incunabula before 1540—probably the largest number in the possession of any private individual. The fate of the Oppenheimer and Friedland collections points to the natural history and ultimate destination of large aggregations of books. Comparatively small collections of books are first made. These are often sold intact to larger collectors, forming rills which go to feed the streams, and ultimately these debouch into some great lake, represented by a public library. But it invariably requires the zealous enthusiasm of the book-collector to bring together any special set of works; and this must always be the case with Hebrew literature. As a rule, collectors of books of Jewish interest have been mainly Jews; but a few Christian Hebraists interested in Jewish learning have also from time to time collected manuscripts and books. The Buxtorfs conducted quite a lively correspondence with booksellers of the east of Europe in order to acquire rare books. Widmanstadt collected the most valuable set of manuscripts now at Munich; while the Bodleian Library contains many valuable manuscripts from the collections of Selden, Pococke, and Hyde. By far the most distinguished of these Christian Hebraists was J. B. de Rossi, whose library of manuscripts, which exceeded 1,000 volumes, is now in the Grand-Ducal Library of Parma. Bishop Kennicott was interested in variœ lectiones of the Bible, and brought together a number of Biblical manuscripts. 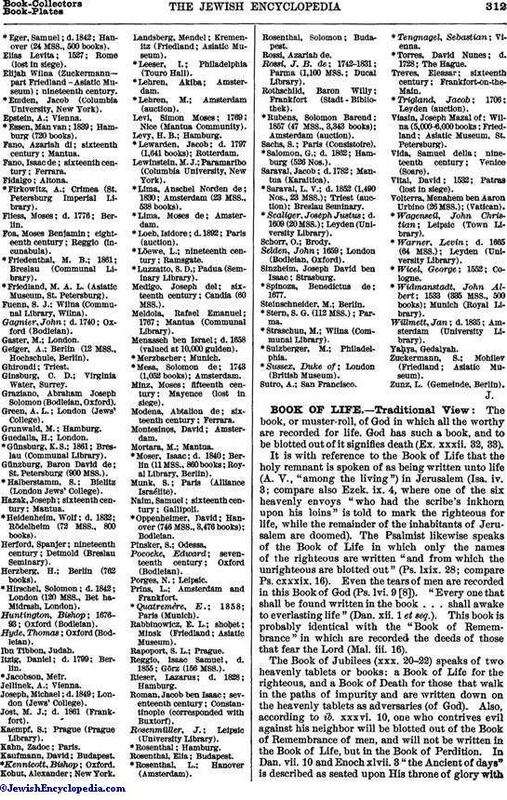 The following list gives the names of the chief book-collectors that can be traced, either from the catalogues of their works (indicated by a star) or from the accounts given by Zunz ("Z. G." pp. 230-249) and Fürst ("B. J." Preface to vol. iii.). Whenever the place is known to which a library went, in whole or in part, this is given in parentheses at the end of the statement. When the number of books or manuscripts is known, this also is given in parentheses, after the name. The dates are sometimes those of the deaths of the owners, sometimes of publication of catalogues or other year of importance for the library in question. The names of Christian collectors are printed in italics. *Abbas, Samuel b. Issac; d. 1693; Amsterdam. *Aboab, Isaac da Fonseca; died 1693 (18 MSS., 373 books); Amsterdam. Adler, S.; New York (Hebrew Union College, Cincinnati). *Aguilar, Moses Raphael de; d. 1680 (50 MSS. ); Amsterdam. *Almanzi, Joseph; Padua (Columbia University, New York). *Aron, Nathan; d. 1780; Schwerin. *Azulai, Ḥayyim Joseph David; d. 1807. Bampi, I. D. B.; Minsk (Friedland; Asiatic Museum). Bank, A. M.; New York (New York Public Library). *Beer, Bernhard; Dresden (Breslau Seminary). Berliner, A.; Berlin (Frankfort, Stadt-Bibliothek). *Bondi, Simon; d. 1816; Dresden (825 books). Bresslau, Meïr ben Israel; d. 1839; Hamburg (12 MSS., 820 books). Cases, Samuel, sixteenth century; Mantua. Cassel, D.; Berlin(5000 books; New York Seminary). *Castro, Rodrigues de; d. 1900; Amsterdam (auction). Chazanowicz. J.; Byelostok (National Library, Jerusalem). Cohen, Albert; Paris (Séminaire Israélite). Cohn, Abraham (550 books); Posen. *Costa, Isaac de; d. 1860; Amsterdam. Da Costa, Solomon ben Isaac; 1759 (180 books); London (British Museum). De Rossi. See Rossi, J. B. de. *Dubno, Solomon; d. 1813; Amsterdam (106 MSS., 2,076 books). *Eger, Samuel; d. 1842; Hanover (24 MSS., 500 books). Elias Levita; 1527; Rome (lost in siege). Elijah Wilna (Zuckermannpart Fridland-Asiatic Museum); nineteenth century. *Emden, Jacob (Columbia University, New York). *Essen, Man van; 1839; Hamburg (720 books). Fano,Azariah di; sixteenth century; Mantua. Fano, Isaac de; sixteenth century; Ferrara. *Firkowitz, A.; Crimea (St. Petersburg Imperial Library). Fliess, Moses; d. 1776; Berlin. Foa, Moses Benjamin; eighteenth century; Reggio (incunabula). *Friedenthal, M. B.; 1861; Breslau (Communal Library). *Friedland, M. A. L. (Asiatic Museum, St. Petersburg). Fuenn, S. J.; Wilna (Communal Library, Wilna). Gagnier, John; d. 1740; Oxford (Bodleian). Geiger, A.; Berlin (12 MSS., Hochschule, Berlin). Ginsburg, C. D.; Virginia Water, Surrey. Graziano, Abraham Joseph Solomon (Bodleian, Oxford). Green, A. L.; London (Jews' College). *Günsburg, K. S.; 1861; Breslau (Communal Library). Günzburg, Baron David de; St. Petersburg (900 MSS.). *Halberstamm, S.; Bielitz (London Jews' College). Hazak, Joseph; sixteenth century; Mantua. *Heidenheim, Wolf; d. 1832; Rödelheim (72 MSS., 800 books). Herford, Spanjer; nineteenth century; Detmold (Breslau Seminary). Herzberg, H.; Berlin (762 books). *Hirschel, Solomon: d. 1842; London (120 MSS., Bet ha-Midrash, London). Huntington, Bishop; 1676-93; Oxford (Bodleian). Itzig, Daniel; d. 1799; Berlin. Joseph, Michael; d. 1849; London (Jews' College). Jost, M. J.; d. 1861 (Frankfort). Kaempf, S.; Prague (Prague Library). Landsberg, Mendel; Kremenitz (Friedland; Asiatic Museum). *Leeser, I.; Philadelphia (Touro Hall). Levi, Simon Moses; 1769; Nice (Mantua Community). *Lewarden, Jacob; d. 1797 (1,641 books); Rotterdam. Lewinstein, M. J.; Paramaribo (Columbia University, New York). *Lima, Anschel Norden de; 1830; Amsterdam (23 MSS., 538 books). *Loeb, Isidore; d. 1892; Paris (auction). *Löewe, L.; nineteenth century; Ramsgate. *Luzzatto, S. D.; Padua (Seminary Library). Medigo, Joseph del; sixteenth century; Candia (60 MSS.). Meldola, Rafael Emanuel; 1767; Mantua (Communal Library). Menasseh ben Israel; d. 1658 (valued at 10,000 gulden). *Mesa, Solomon de; 1743 (1,052 books); Amsterdam. Minz, Moses; fifteenth century; Mayence (lost in siege). Modena, Abtalion de; sixteenth century; Ferrara. *Moser, Isaac; d. 1840; Berlin (11 MSS., 860 books; Royal Library, Berlin). Munk. S.; Paris (Alliance Israélite). Naim, Samuel; sixteenth century; Gallipoli. *Oppenheimer, David; Hanover (746 MSS., 3,476 books); Bodleian. Pococke, Edward; seventeenth century; Oxford (Bodleian). Prins, L.; Amsterdam and Frankfort. *Quartremère, E.; 1858; Paris (Munich). Rabbinowicz, E. L.; shoḥet; Minsk (Friedland; Asiatic Museum). Reggio, Isaac Samuel, d. 1855; Görz (156 MSS.). Rieser, Lazarus; d. 1828; Hamburg. Roman, Jacob ben Isaac; seventeenth century; Constantinople (corresponded with Buxtorf). Rosenmüller, J.; Leipsic (University Library). Rossi, J. B. de; 1742-1831; Parma (1,100 MSS. ; Ducal Library). Rothschild, Baron Willy; Frankfort (Stadt - Bibliothek). *Rubens, Solomon Barend; 1857 (47 MSS., 3,343 books); Amsterdam (auction). *Salomon, G.; d. 1862; Hamburg (526 Nos.). Saraval, Jacob; d. 1782; Mantua (Karaitica). *Saraval, L. V.; d. 1852 (1,490 Nos., 23 MSS. ); Triest (auction); Breslau Seminary. *Scaliger, Joseph Justus; d. 1609 (20 MSS. ); Leyden (University Library). Selden, John; 1659; London (Bodleian, Oxford). Sinzheim, Joseph David ben Isaac; Strasburg. *Stern, S. G. (112 MSS. ); Parma. *Straschun, M.; Wilna (Communal Library). *Sussex, Duke of; London (British Museum). *Torres, David Nunes; d. 1728; The Hague. Treves, Eleasar; sixteenth century; Frankfort-on-the-Main. *Trigland, Jacob; 1706; Leyden (auction). Viasin, Joseph Mazal of Wilna (5,000-6,000 books; Friedland; Asiatic Museum, St. Petersburg). Vida, Samuel della; nineteenth century; Venice (Soare). Vital, David; 1532; Patras (lost in siege). Volterra, Menahem ben Aaron Urbino (26 MSS. ); (Vatican). *Wagenseil, John Christian; Leipsic (Town Library). *Warner, Levin; d. 1665 (64 MSS. ); Leyden (University Library). *Widmanstadt, John Albert; 1533 (335 MSS., 500 books); Munich (Royal Library). Willmett, Jan; d. 1835; Amsterdam (University Library). Zuckermann, S.; Mohilev (Friedland; Asiatic Museum).